YouTube is usually one of the first places to look for breaking news, and now Google seems to be making that even easier by adding a “Breaking News” carousel to its mobile apps and homepage, as spotted by Android Police. The new section appears similar to a recommended channel on the web homepage, and as a scrollable carousel in the mobile app between suggested videos. At the time of publication, the breaking news section was largely focused on reports of Steve Bannon leaving his position at the White House, but Android Police noted that it had been filled with videos regarding the Barcelona terror attack earlier in the day. For now, it’s unclear whether Google is populating this section algorithmically or curating content by hand, or whether or not it’ll even appear at all times or just during breaking news cycles. 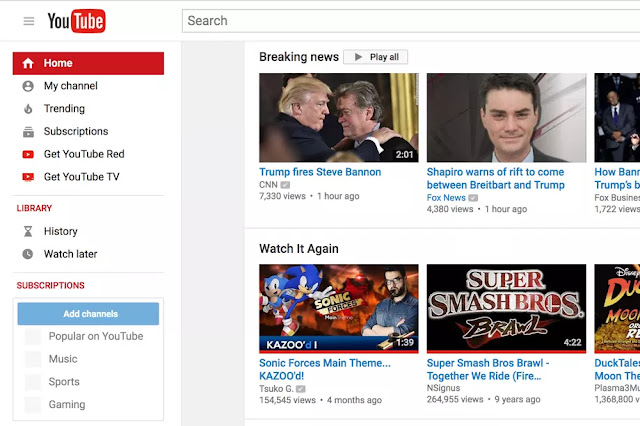 Still, it’s another useful addition to the front page of YouTube that will hopefully help keep people informed during fast new cycles.